LiveU plans to expand their affordable, hybrid global IP satellite service, which works in combination with the company's HEVC bonding technology. Increasing the range of options, the new solution, based on Eutelsat's KA-SAT satellite, will allow customers to use satellite or cellular connectivity seamlessly, streamlining both the billing structure and workflow. LiveU will be offering customers in Europe Ka-band satellite airtime in combination with their current cellular roaming data packages. Using this hybrid solution, operators don’t have to choose manually which network to use; the connectivity choice is made automatically based on a combination of signal strength and cost-effectiveness. LiveU will be working with Eutelsat, whose KA-SAT satellite wide beam footprint extends directly across Europe and parts of North Africa. The collaboration uses NewsSpotter, Eutelsat’s state-of-the-art Satellite News Gathering (SNG) product, developed in response to an increasing demand to transfer rich media content from the field. NewsSpotter is highly efficient via extremely compact satellite terminals and also innovative, providing native bidirectional IP connectivity, facilitating integration with modern news production and media content management workflows. Being Ka-band-based, NewsSpotter terminals are compact and portable enough to fit in a backpack and be mounted on a small car. Customers can now take advantage of LiveU’s LU600 HEVC solution to use satellite connectivity whenever desirable. This is a fully bundled service with a single-point-of-contact for support and a single bill. A range of packages are available. Visit LiveU at IBC on stand 3.B62 and Eutelsat on stand 1.D59 to learn more about this solution. Zion Eilam, Regional VP Sales (EMEA), LiveU, said, that this is a truly integrated service offering, bringing together the best of both worlds via market leaders in their respective fields. Making this as seamless and effortless as possible for our customers was essential, ensuring that they can concentrate on bringing high-quality live content to their viewers. 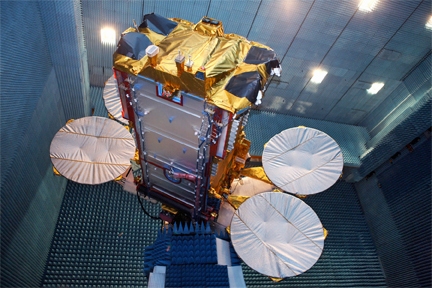 Partnering with Eutelsat has achieved that, complementing the company's existing hybrid Ku-satellite service solution. Gerry O’Sullivan, EVP, Global TV and Video of Eutelsat, noted that undoubtedly the contribution market, especially news, has changed significantly in recent years, with speed of deployment and mobility — at realistic price points — increasingly taking center stage. NewsSpotter was a clear response to that and this collaboration with LiveU is the natural next step.